Writing a Government Grant: SF 424, EIN And DUNS Oh My! This guide is here to make the federal grant writing process as easy as possible no matter what category your nonprofit falls under. That statement in and of itself is an oxy-moron because until you’ve written a dozen or two federal grants it doesn’t seem to be either simple or easy. The one big form almost every federal grant will require is the SF 424. “SF” means Standard Form and has a couple of components/attachments uniquely called SF 424-A, SF 424-B , SF 424-C and (you guessed it) the SF 424-D. The A, B, C and D forms are either signature pages or budget information that will be specific to your project. My hope is to have for you in one place all the information you will need to complete the SF-424. My assumption is all the information needed may not be at your fingertips. We will also cover obtaining your DUNS and EIN numbers. These tools are full of hyperlinks so you can easily click to find the information. That’s why this is in an electronic format. (Also, for as long I can stand it, I’ll be glad to update any dead links). I have helped non-profits, local governments, hospitals and school districts receive over $1 billion in federal money and it is from this experience that I’m are sharing these grant writing resources. Get More Grant Writing Tips In Our Knowledge Base. Starting with the Standard Form 424, download from here, let’s begin with #1. Type of Application. We are going with the idea this is a new application. If it were a revision or a continuation then why are you using this Tool Kit? You’ve already pulled all your hair out once. Applicant Identifier. If you need this number it will be given to you by the federal agency your are applying to. 5a. Federal Entity Identifier. If your agency needs this number included they will (should) provide you with it. I suggest adding this to your To Do list when you reach out to your agency point of contact. 5b. Federal Award Identifier. Notice this is the AWARD Identifier not the ENTITY Identifier from Item 5a. But who cares because you don’t need this for a first time application. Date Received by State. Leave it blank. One less thing you have to do. State Application Identifier. The agency’s state office will fill this out if it’s applicable. 8a. Legal Name. I expect you will know this. This is really one of the easiest things to do and the IRS has made it very user-friendly (yes, I said friendly and IRS in the same sentence). 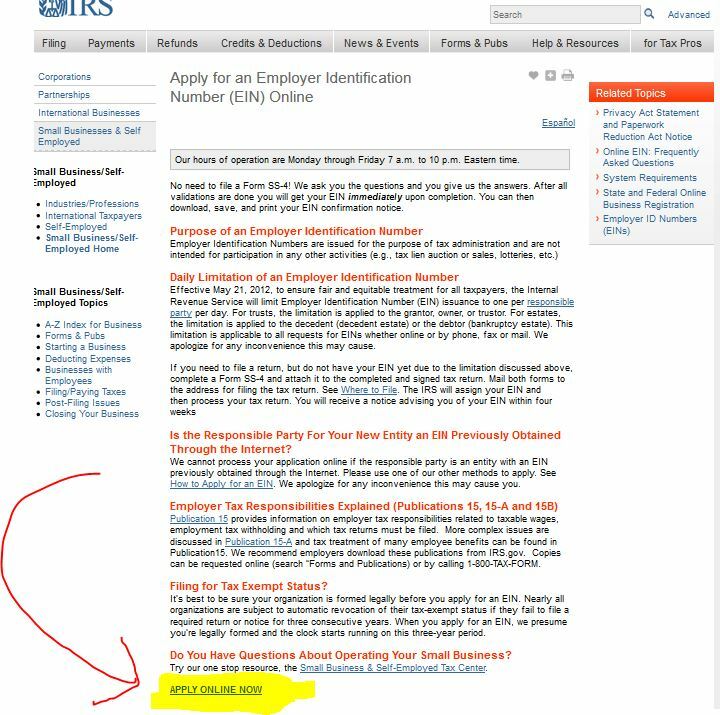 Scroll down to the bottom of the screen and you should see the APPLY ONLINE NOW link (I highlighted it in yellow. 8c. Organizational DUNS. This one takes a bit longer but you must have a DUNS number before you get any grant money. 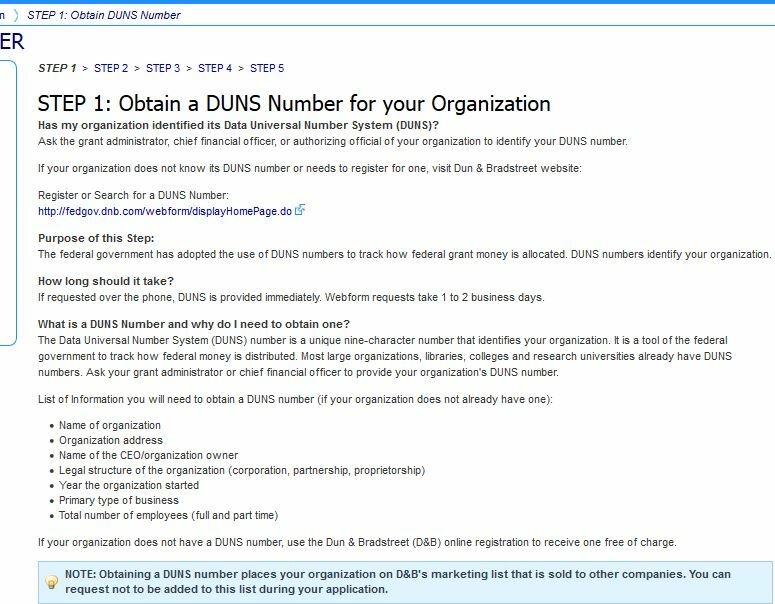 A DUNS number means the Data Universal Numbers System (remember we grant writers love acronyms). This is like your organization/business’s social security number. It’s not too painful. The rest of the process is pretty simple. The primary focus is to make sure you are a real entity (business, government, non-profit, etc) and not that Nigerian prince who wants your checking account information. There will be a series of verification questions in an attempt to match you to your physical address. If you are not a business it will seek to find your home address. If you are like most people, you don’t recall or use your address just the way the post office does. For example, you may use 225 West Main Street and the DUNS system wants your address to be 225 W Main St. It won’t take long to finish. Step 3: After this will be another series of verification questions like EIN/TIN numbers, social security numbers, former phone numbers, etc. Step 4: After all the verification has been completed you will then set your password and answer some security questions in case you forget your password. It will also ask why you are seeking a DUNS number and most people reading this Tool Kit will select “because you wish to be a grant recipient”. It will then ask if you want to join mailing lists. Step 5: After this press CONTINUE and you’ll have your very own DUNS number. 8d. Address. This is simply your mailing address. 8e. Organizational Unit. This helps to give more specificity to your particular unit or department. For example you may be the Boys and Girls Club of Greater XYZ Town but you are applying for funds that will go to the Summer Camp Committee. Don’t sweat this if it’s not readily available or applicable. 8f. Name and Contact Information, etc. Typical stuff. Type of Applicant 1: Select Applicant Type: If you are using the SF-424 we provided you will see a draw down menu that allows you to select what kind of creature you are. If you are unsure refer to the official Instructions Sheet and see the options. You may be a nonprofit created from within another entity, for example a business incubator that’s wholly operated by a Historically Black College or University (HBCU – more acronyms!). That’s why you will see up to three Applicant Types to select. There is also an “Other” category if you don’t fit within any of the draw-down menu options. Competition Identifier Number. It isn’t too often you’ll see this posted on a grant announcement (like the example from the Park Service). Don’t sweat it if you can’t find it. Areas Affected by Project (Cities, Counties, States, etc.) This is where you will list those places where the grant monies will be used. If you are a multi-site applicant then you’ve got to list all the areas where the funds will be used. For example, if you are the Greater Pine Belt Library District and you are purchasing a book mobile, you’ll need to list the cities or counties (or parishes for our Louisiana friends) where the book mobile will be roaming around getting kids hooked on books. Descriptive Title of Applicant’s Project. Just jot down a few sentences about the project. It could be as simple as “purchasing a fire truck” to “repairing the roof on the cafeteria” to “paving the parking lot for main street businesses”. This is a quick title the federal agency will use to inform the press and members of Congress about the project. They will also notify the US Senators from your state as well. The *a Applicant and the *b Program/Project are listed separately in case your organization is headquartered in one location which is in Congressional District X and the project will be in Congressional District Y. So if the book mobile is going to roam around several Congressional districts you’ll need to list each of those. You will also notice it says you can attach an additional list of districts if need be. Proposed Project. You’ll see *a. Start Date and *b. End Date and don’t let these catch you off guard. These are proposed ideas of when you’ll begin to use the money you are applying for. It will be real easy to determine if you are a building a medical office clinic to know when you plan on beginning construction and when you plan on being through with construction. No one is holding you to a contractor’s timeline – which is nothing you can control anyway. This is your best guess and what you hope/plan on being the duration of the project. If it’s for a piece of equipment you’re best to say when you’ll use it and maybe the life expectancy of that equipment. Estimated Funding ($): Remember there is very likely a match required for your grant and the federal government wants to see who else is putting in the money for success. There is a big “no-no” called fed-to-fed matches meaning you can’t use federal dollars from one federal agency to “count” as the match for another federal agency. It’s a good trick to try but it won’t work. These figures also determine how many points you’ll get on your application (if your particular grant is scored that way). Filling in this section is really the art of the grant writing process and not the science of it. IN NO WAY am I suggesting the information you provide not be true and correct (you have to sign the application stating that in Item 21). I’m simply trying to give you insight from my experience that the feds want to see how far they can stretch their dollars and how much skin you have in the game. Back in the 1980s an Executive Order came from the White House saying every state must have a State Clearinghouse Officer that allowed anyone/everyone a chance to know when an application was being filed for federal funds from your state. Clearinghouse is a great word because that is precisely what it is. It was Executive Order 12372. Over a period of time several states decided an Executive Order in this instance is really an Executive Suggestion and they weren’t going to participate in the Executive Order 12372 so today only 25 states/territories participate. Each state that has a clearinghouse prepares a list of all the grants that were applied for during a certain time period (usually monthly) and that list is mailed to any group that wants to be on the mailing list. It’s public information. This can be used for community organizations who want to get ready for public hearings (which are needed for federal funds to be disbursed). A copy of your SF-424 needs to be sent to the appropriate person at your State Clearinghouse and you have two choices of which box to check: 19 a. or 19 b.
Hopefully you get to check 19c. which means we don’t use the state clearinghouse in our state so I don’t have to send this to anyone. I’ve included a list of the states that use the State Clearinghouse and their contact information at the end of the Tool Kit after the blank SF-424. Is the Applicant Delinquent… It’s not my business but if you have to check yes but you can guess how excited the government will be in giving you a grant. Signatures. Here is where you are signing on the bottom line. Typically this Authorized Representative is the same person who is the Contact Person mentioned in 8f. but it may not be. The Authorized Representative is the person who has the ability to obligate the applicant to all the stuff you just signed and a truck load of other stuff. That doesn’t mean, however, the Authorized Representative is the person who is handling this grant. For example, the Authorized Representative may be the mayor of the city but the police chief is filling out a grant application for a new patrol car. The chief would be the Contact Person from 8f. but the Authorized Representative is the mayor who got approval at a city board meeting to enter into the grant. On the grants we write we are the Contact Person on 8f and we are never the Authorized Representative because we have no authority to bind the applicant. You’ll certainly have questions for your agency representative. My suggestion is to go through the SF-424 and gather all your questions then call your agency and ask for everything at once. They will appreciate you don’t have to ask “What’s a DUNS number?” or “Whose is my Congresswoman?” Keep in mind the SF-424 is just the start to your application. The agency will have a truckload of other forms to keep you busy. Hopefully these will all be done online via grants.gov but you can’t bet on it.